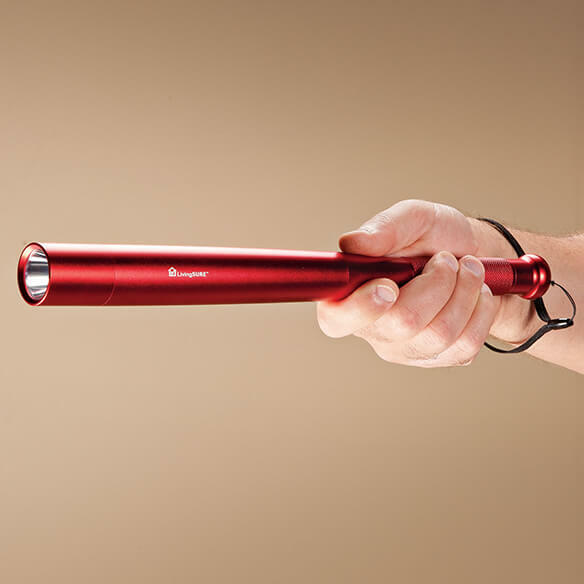 Flashlight baton by LivingSURE™ puts power in your palm while lighting your path. Red metal security flashlight features 3 settings: bright, dim, and attention-getting flashing. Durable, heavy-duty design doubles as a personal defense baton, complete with textured grip and wrist strap for extra security. Bright flashlight's on/off switch is located at the base for easy, instant access without fumbling in the dark. Overall measures 14" L and weighs 0.68 lb. Self defense flashlight requires 3 AA batteries (not included). I have bought dozens of this item to give to family and friends. It is the size of a small child’s bat but is made of metal. This is a hefty thing to have nearby for protection. It is easily hidden in a car door pocket or between the front seats. It could also be carried inside of a coat. Also using it as a flashlight is great! The distance it shows is about 20 feet. There are three choices—very bright, medium bright, and strobe light. The strobe light is great for shining in the eyes of people who are disturbing you. I really like this product. I keep it next to my bed for security and for when the power goes out. I feel secure with this flashlight. It is built solidly. It lights up a large area and is wonderfully bright. Use this at night while walking my dogs, the flashlight is great and I feel a bit safer. I had one of these before and it gave many years of service before it died. Was very pleased to find that Walter Drake still carried the product and happily ordered a replacement. Bright LED, and excellent protection if ever needed on a dark night. The steady beam converts to a flashing light as well, sure to capture attention. Not quire the size of the baseball bat it resembles, this flashlight is nicely balanced, fits well in one's hand, and also has a small wrist strap. Excellent produced, based on my former one, long-lived and unlike some flashlights easy to find when the power goes out thanks to it length. Great item! So much better than I thought. It is well made and really big!! I bought for gifts and they loved it!! It looks so expensive but was really reasonable. I think this flashlight will fit in my walker bag nicely.